German architects discover the made in FVG: incoming from Berlin for the Italia for Contract network. The internationalization of the furniture and home system sector of Friuli Venezia Giulia’s Region continues for the Italian for Contract network, coordinated by the Furniture Cluster. After the satisfactions gathered in Cologne at “Interzum”, the world’s largest subcontracting fair for the furniture industry and semi-finished products, and the successful participation in Canada at one of the major event dedicated to the new trends in architecture and design, now it’s up to “Made in Fvg” to welcome foreign professionals in the sector, starting with Germany, a historic customer. With the collaboration of ICE Berlin, the Furniture Cluster hosted six of the most important architecture studios in Berlin: three day during which the architects discovered six business realities (Oikos, Pratic, Frag, Tonon, Crassevig, Marmi Vrech) belonging to the Italian for Contract network, their know-how, the quality and innovation of Made in Italy. 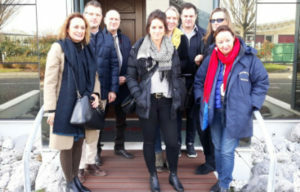 From B2B, organized in Udine, to one-to-one meetings, the tour also extended to visits to the factories and the showrooms of the companies, where German operators could touch the details of the Friuli production (and even Veneto with Oikos), thus consolidating the foundations laid abroad by the regional house system. Berlin architects and companies from the Italy for Contract network closed the experience with a networking dinner and a convivial moment.